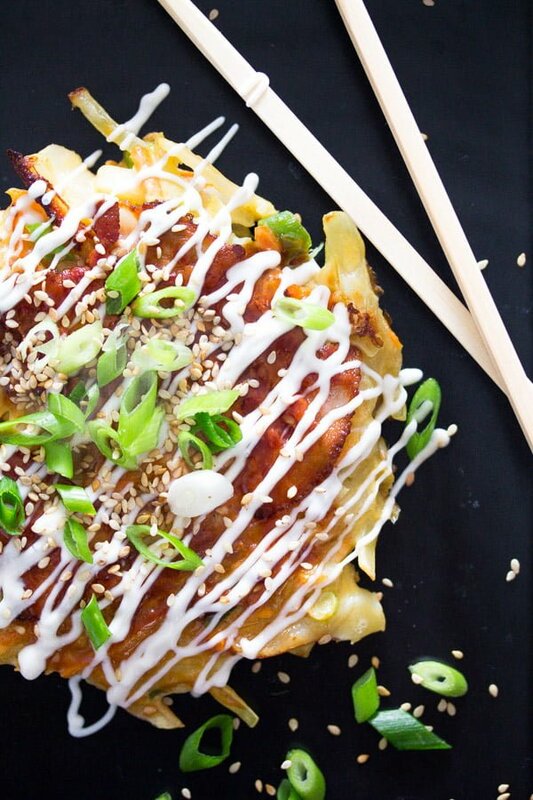 Savory Japanese pancakes – okonomiyaki – with cabbage and bacon, served with homemade okonomiyaki sauce and Japanese mayonnaise. 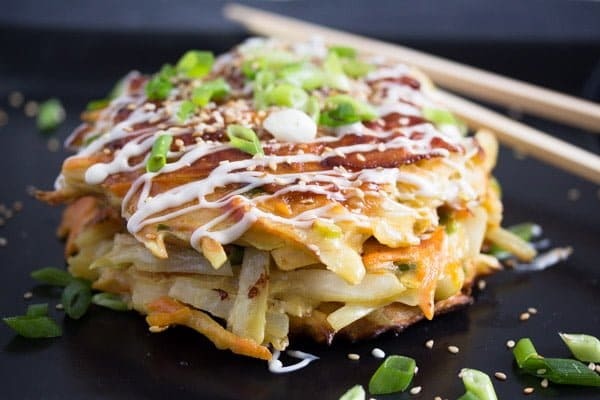 Okonomiyaki, translated as “grilled as you like” is a savory Japanese pancake (or some might call it Japanese pizza) made with lots of cabbage, some pancake batter and topped with several other ingredients that you might like to add. 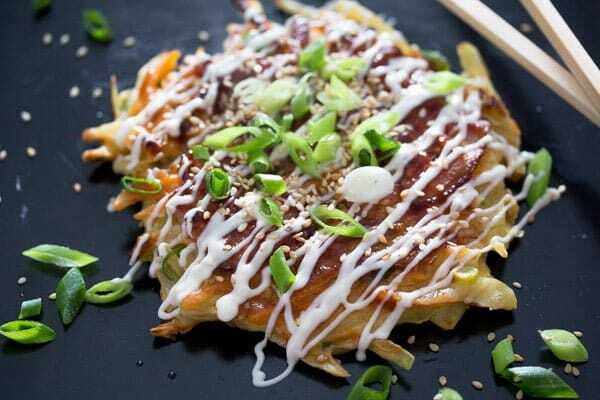 The cooked okonomiyaki is then topped with some delicious okonomiyaki sauce and served with Japanese mayonnaise. 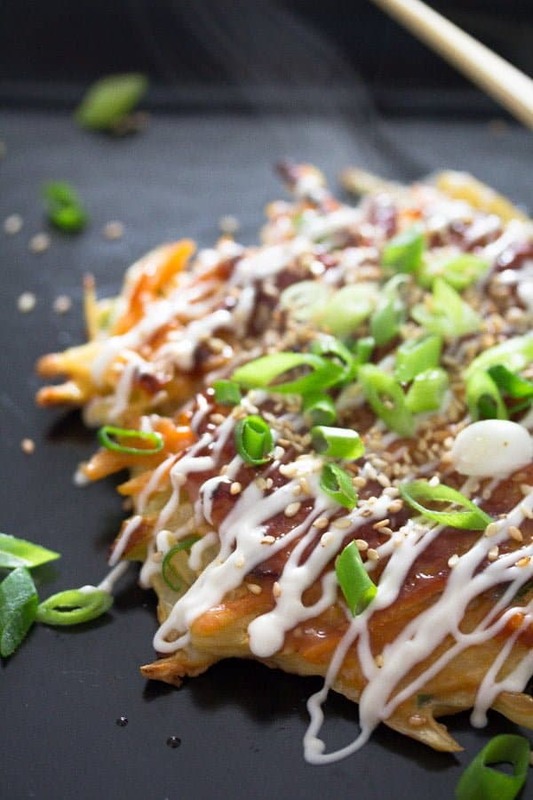 An amazing dish this okonomiyaki, really! One of those dishes that make you wonder why on Earth you haven’t tried this recipe years ago already. I remember seeing and writing down a recipe for okonomiyaki years ago (my son was just born) and I have always meant to cook, but for one reason or another I never did. Such a shame! But now that I have finally managed to cook okonomiyaki, I know for sure I will make one version or another of it many many times. I didn’t have the chance to eat much Japanese food, I adore sushi, but I have it rather seldom because we have to drive to a really large city in order to get good sushi, what we normally get here at the Chinese restaurant is a joke. Otherwise, I have had tonkatsu once and I make dashi and ramen soup quite often. Early versions of okonomiyaki can be traced back to the 16th century. However, that early version, called funoyaki, was more of a thin pancake smeared with miso. This kind of pancake evolved in time to what it is today and it was mainly during and after World War II that the pancake transformed to okonomiyaki. Rice supplies were scarce during this time, so people started to eat more flour based dishes, which were cheaper and filling. Cabbage, also a cheap and easy to grow ingredient started being added to the pancake to make it more filling. In time, more and more ingredients were added, depending on the cook’s and eater’s taste and possibilities and so the okonomiyaki was born. There are two main types of okonomiyaki: the Kansai or Osaka style and the Hiroshima style. In the Kansai style all the ingredients are mixed in the batter and then grilled. Other ingredients are then layered on top, what you put on it depends on taste. 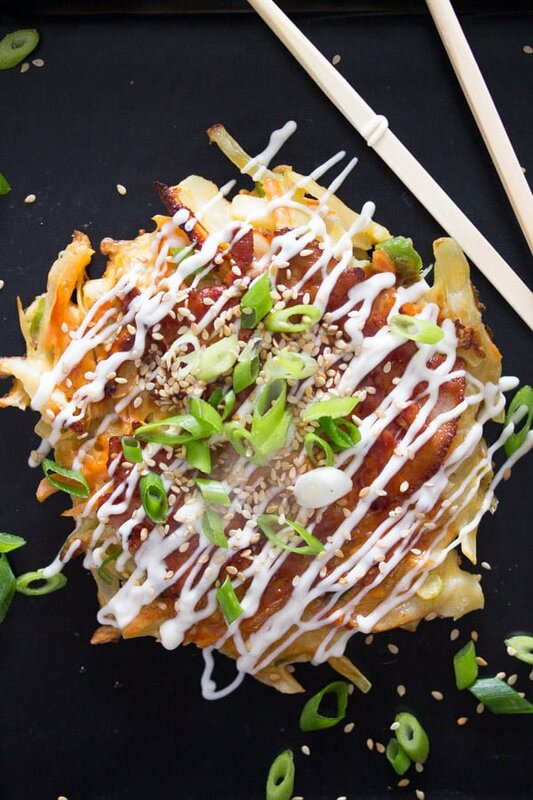 Today’s Okonomiyaki – Japanese Cabbage Pancake is more of a Kansai/Osaka style okonomiyaki. 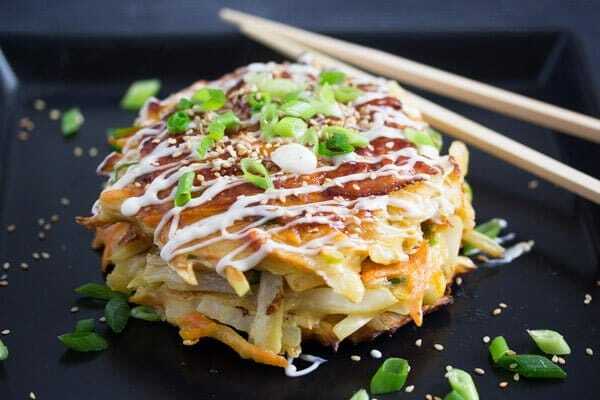 The chopped cabbage is mixed with the batter, the pancakes are grilled or pan fried and then basted with okonomiyaki sauce and topped with other ingredients like green onions and sesame seeds and served with homemade Japanese mayonnaise. When you cook okonomiyaki Hiroshima style you will first make the pancake/crepe and then pile the remaining ingredients on top, starting with lots of cabbage. My version of okonomiyaki is a simplified or Europeanized version of the okonomiyaki. It is not that I didn’t want to make an original Japanese okonomiyaki, but after reading a few recipes and searching for Japanese ingredients to buy online, I realized that I really did not want to turn such a simple recipe into an overly expensive affair. Buying the ingredients would have cost me about 30 Euros, which is a lot for one homemade meal. And I was worried about not being able to use the leftover pricey ingredients for something else before they expired, it happens often when buying such exotic things… I think, many of you, living in places that don’t easily have access to such ingredients feel the same. So, I compromised, used what I had, made okonomiyaki sauce and Japanese mayonnaise myself and I could not have been happier. (Well, I would probably be happier if I’d get the chance to eat an original okonomiyaki, preferably in Japan). The dish was scrumptious, we all loved it, kids included, everybody told me that I definitely have to cook okonomiyaki again. And I did, we had this dish several times already and that in a relatively short period of time. 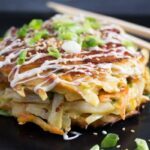 And if you would like to see a recipe for a truly Japanese okonomiyaki, using all the Japanese ingredients needed, have a look at Just One Cookbook’s Okonomiyaki, it looks and sounds amazing. It is there as well that I found recipes for making the okonomiyaki sauce and the homemade Japanese mayonnaise. All perfect! Add dashi to the batter, if you happen to have it. If not, use water instead. I used instant dashi this time, but I have made the okonomiyaki with water as well and it was still delicious. Adjust the heat when cooking the okonomiyaki. Start with medium-low heat, but if you notice that the underside of the first okonomiyaki you cook is too dark, turn the heat down a bit more. Definitely use a lid to cook the okonomiyaki. The steam that forms inside the pan helps cook the cabbage and carrots. I needed about 18 bacon slices (2 packs, each weighing 100 g/ 3.5 oz) for the okonomiyaki. German bacon is extremely thinly sliced and very narrow, so that is why 18 slices. Use as much thinly sliced bacon to cover the pancake as needed and desired. It is best using two pans when cooking okonomiyaki. There will be only enough place for one pancake in a regular sized pan, so it will take quite a long time to cook them all. Using two pans will halve the cooking time. Give the cooked pancakes on a plate and keep them warm in the oven (at about 80 degrees Celsius/ 180 degrees Fahrenheit) while you cook the rest. 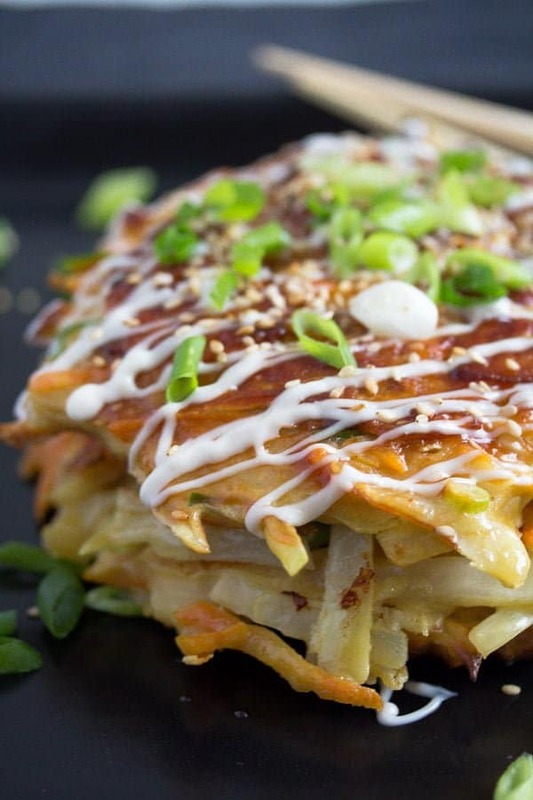 Okonomiyaki – Japanese Cabbage Pancakes can be frozen. Pack them in aluminum foil and when defrosted, heat them up in the oven. Leftover Japanese mayonnaise is great on ham and cheese sandwiches. Whisk together sugar, oyster sauce, ketchup and Worcestershire sauce until the sugar is dissolved. Set aside. Whisk together mayonnaise, rice vinegar and sugar. Set aside. Shred the cabbage and the carrots. Thinly slice all the green onions. Set aside about ¼ of the green onions, preferably more green parts, for sprinkling over the okonomiyaki later. In a large bowl, whisk together the eggs, dashi or water, soy sauce and salt together. Slowly add the flour and whisk to obtain a thick, smooth batter. Stir in the vegetables. Cut the bacon slices in half or quarter them, depending on size. Heat about ½ tablespoon of the oil in a non-stick or cast iron pan. Give about 1 cup of the batter to the pan and press with a spoon to form a circle of about 15 cm/ 6 inches diameter and about 1.2 cm/ ½ inch thick. Cover the pancake with some bacon slices, as much as need to cover the okonomiyaki, depends on the size of the bacon slices. Cover the pan with a lid, this will help the cabbage get soft. Turn the heat a bit down, so that the underside of the pancake doesn't get too dark. If you notice that after you have turned the first pancake, adjust the temperature again. The pancakes should be golden brown and not too dark. Cook the pancake on the first side for 5 minutes until the bottom is golden brown. Flip with a spatula and cook, covered, for another 3-5 minutes or until golden brown. It is not a bad idea to use two pans when cooking okonomiyaki, you can only cook one at a time and cooking 6 of them will take quite a while. Using two pans will halve the cooking time. Give the cooked okonomiyaki on a plate and keep warm in the oven while you cook the rest. Add a little more oil to the pan before starting with each okonomiyaki. When all the okonomiyaki are cooked, brush them with okonomiyaki sauce. Drizzle with the Japanese mayonnaise. Sprinkle with the remaining green onions and with sesame seeds and serve. I needed about 18 bacon slices (2 packs, each weighing 100 g/ 3.5 oz) for the okonomiyaki. German bacon is extremely thinly sliced and very narrow, so that is why 18 slices. Use as much thinly sliced bacon to cover the pancake as needed. They are delightful. I’ve made them for my Taste the World and they were delicious. Your version looks just as good as the original one. I love okonomiyaki. My husband and I have this “rule”, if a Chinese restaurant serves Japanese food, do not the Japanese food, especially the sushi and sashimi, they are hardly ever good like you said, a joke! I have yet to encounter one that can do both well. If a sushi restaurant offers ramen, we do not order their ramen either. We usually go to the ones that specialized in ramen noodles. It’s just us though. We have had enough bad experiences to come up with such conclusion LOL! sadly, they are consistent with our findings ! Hi Adina – these Japanese pancakes are amazing. I have never seen anything like them, and whenever bacon is involved, well…enough said! 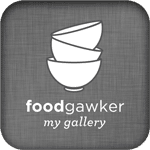 Your photos are stunning, makes me want to whip up a batch today. The only ingredient I don’t have in my pantry for this is the oyster sauce, but that’s not a big deal to find. Looks like lots of delicious flavor, thanks for another great recipe!